The series of bags beneath the eye, repeating the lower curve of the eye itself three times, appears also on the unusual smoky-amethyst example with tourmaline needles, Sale 2, lot 34, which is stylistically so similar in many ways that it must be from the same workshop, probably the same hand. 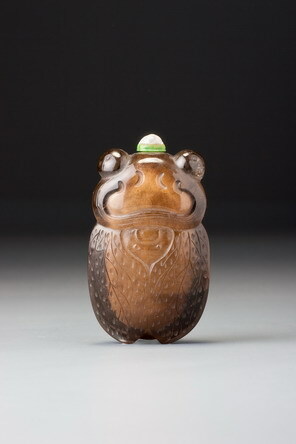 Among the creature-form snuff bottles, the cicada ranks as one of the more popular. It enjoyed both potent longevity symbolism and association with the ancient culture, since it appeared commonly in burials and was a widely used decorative motif on ancient bronzes (see discussions, Sale 4, lot 22, and Moss, Graham, and Tsang 1993, nos. 7 and 8, although the larvae stage of the creature’s development was wrongly stated under no. 7). Another reason for its popularity as a snuff bottle was its suitability as a snuff-bottle form, which is discussed under Sale 2, lot 34. The hollowing of this bottle is extremely clever. By leaving a very thick wall in the winged area, the carver has cancelled out the effects of foreshortening the wings. With the transparency of the material, the carver was able to give the impression from the main view, looking down on the back, that the wings extend beyond the body more than they do, leaving the hollowing to read as the body seen through the wings, which are also transparent in real life.